Hampi, one of the World Heritage Monuments of India, was once the capital of the mighty Vijayanagar empire (1336-1565) which extended from the Arabian Sea to the Bay of Bengal and from the Deccan Plateau to the tip of the Indian Peninsula. The Vijayanagar kings were great patrons of art and architecture as is evident in the vast ruins of Hampi. Achyuta Raya Temple; Chakrathirtha; Elephant Stables; Hazara Rama Temple; Kodandarama Temple; Krishna Temple; The Lotus Mahal; Monolithic Ganesha; Monolithic Narasimha; Queen's Bath; Royal Performance Zone; Virupaksha Temple; Vittala Temple. USD 5 or Rs.250/- (Foreigners). Closed on Mon. There is an Archaeological Survey of India Museum in Kamalapura (3 Km.). Timings : 1030 to 1800 hrs. Closed on friday. 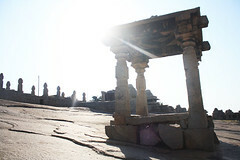 Hampi Festival is held from 3rd to 5th of Nov. every year. Tungabhadra Dam (17 Km.) : The high masonary dam is about 590 metres long and 49 metres high. The reservoir has a storage capacity of 1,32,559 million cubic feet of water spread over an area of 379 sq.km. Huligi (50 Km.) 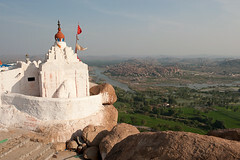 : Religious Centre on the banks of Tungabhadra River. Chitradurga (150 Km.) : This hill fort has 14 temples, remains of a palace and mosque built by Tipu Sultan and an Archaeological Museum. Veda Comforts, Tel: 27393 (Rs.270/-); Hotel Vijay-Vashishta Deluxe lodge, Tel: 24385 (Rs.100-175/-). Area : 26 Sq.km. Altitude : 467 Metres. Temperature : Summer Max: 41 Deg.C. Min: 37 Deg.C. Winter Max: 27 Deg.C. Min: 24 Deg.C. Rainfall : 57.2 Cm. Season : October to March. Air : The nearest airport is Hubli (151 Km.). Convenient airport is Bangalore (325 Km.) connected by Indian Airlines and private airlines with major cities. Fare : Mumbai - Bangalore : Rs.4255/-(Y) , Rs.6080/- (J). There are Helicopter services available from Bangalore. Rail : The nearest railhead Hospet (12 Km.) is connected by rail with Bangalore, Hubli and Guntakal. Fare: Mumbai-Hospet (Via Guntakal): IInd A/c : Rs.1410/-, IInd class : Rs.330/-. Road : Hampi is connected by road with Aihole 156 Km., Badami 180 Km., Bangalore 325 Km., Bellary 74 Km., Belgaum 259 Km., Bidar 379 Km., Bijapur 248 Km., Gadag 98 Km., Gulbarga 264 Km., Guntakal 133 Km., Hassan 353 Km., Hospet 13 Km., Hubli 151 Km., Mangalore 404 Km., Mysore 491 Km., Panaji 325 Km., Pattadakal 173 Km. Hampi is connected by frequent bus services with Hospet and Kamalpur. Hospet in turn is connected with important cities / towns in Karnataka. Santhi Guest House, Tel : 41568. (Rs100./-). Dharamshalas and rooms at nominal rates are maintained by the Virupaksha Temple authorities. Reservations: The Executive Officer, Virupaksha Temple, Hampi-583201. Hotel Karthik, S.P. Road, Tel : 25639 / 20038 (A/c Dbl : Rs.500/-, Dlx Rs.300/-); Malligi Tourist Home, 6 /143, Jambunatha Road, Tel: 28101. Fax : 27038, (A/c : Rs. 350-1600/-, Non A/c. : Rs. 250/-); Hotel Nagarjuna Residency, Patel Nagar, Tel: 29009; Hotel Priyadarshni, V/45-A, Station Road, Tel: 28838 (Rs.300-500/-); Sri Krishna Tourist Home, Near Markandeya Temple Cross, Tel : 28835, 28156 (A/c Dbl : Rs.370/-, Dlx : Rs.260/-); Shivananda Hotel, College Road, Tel : 24031; Shanbhag Towers International (P) Ltd., Tel : 25919. Inspection Bungalow, Amaravati Extension, Tel: 28441. Reservations: Asst. Engineer, PWD, No.2, Sub-division, Hospet, Tel: 28754. Municipal Pravasi Mandir, Station Road, Tel: 28340. Reservations: The Municipal Commissioner, City Municipal Council, Tel: 28340. Railway Retiring Room, Hospet Railway Station. Reservations: Station Supdt., Hospet Railway Station, Tel: 28360. Hotel Mayura Bhuvaneshwari (KSTDC), Kamalapura, Tel: 08394 - 41574. Tourist Information Counter, Hampi Bazar, Hampi, Tel:41339. The Manager, Hotel Mayura Bhuvaneshwari, Kamalpur, Hampi, Tel:41574. Tourist Bureau, Dept of Tourism, Govt. of Karnataka, Taluk Office premises, Hospet, Tel:28537. KSTDC, 10/4, Kasturba Road, Bangalore-560 001. Tel: 080-227403. Karnataka Tourism Information Centre, No. 3, World Trade Centre, Cuffe Parade, Mumbai, Tel:2181658.